Bill and Bob, members of the Blue Bird Nudist Society, certainly had no qualms with the new security measures at Detroit airport. It took months for the Darwen brothers to realize their act would be much more successful with the ladies if they used top hats. 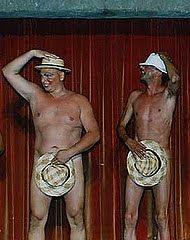 Just as the Johnson Brothers were about to finish their rendition of the striptease from The Full Monty, the crowd begged, "Please, leave your hats on!" Congratulations Freak Smack. 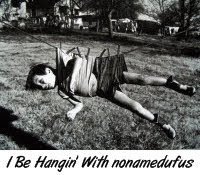 You be hangin' with Nonamedufus this week. FreakSmack again, for the win! Congratulations! Congrats to the Freak of Smack!!! Good choice with FreakSmack. That one was hard. As I just admitted on MeMe's blog, my synapses were shooting blanks that day. I didn't even try for either caption contest. Those suckers better get electrified and moving! CL: I think he's a first-time winner here. Tanya: He had a great caption. Me-Me: He made for stiff competition. Quirks: Speaking of shooting blanks, these guys could keep you company.